“I would like to share the reasons I chose the word ‘balance’ out of all the words and phrases in the poem. There are many small reasons, but I would like to share the two big ones. From Middle School on, I have always had issues feeling like an outsider and searching for acceptance. I always wanted to feel that I was part of a group, that I belonged to something ‘big.’ Although I now have more than one group of amazing friends, this is something I still struggle with to this day, at the age of 29. One of the reasons I struggle with these feelings, and many others, is because of bipolar disorder. I was not properly diagnosed or medicated until 6 years ago, and although I have made many personal strides since then, it is something I will struggle with my entire life. Mood swings, anger issues, racing thoughts, paranoia, and anxiety are only a few of the issues I deal with as a result of having this brain disorder. This has made it even harder to feel accepted, as one of my big paranoia/anxiety triggers is feeling like others, whether they be strangers or friends, are edging me out or conspiring against me. Every day, I search for balance, whether it’s balancing my moods, balancing the racing thoughts swirling through my head like a cyclone, or balancing what is real and what exists only in my head. I have 13 tattoos; the ‘balance’ tattoo is my most recent addition. I wanted something to represent my bipolar disorder, without getting something too negative or a cliché. When I heard about the Love Letter To the World project, I was thrilled to be a part of something so big and so wonderful. When I read the poem, the word ‘balance’ jumped out at me. This world is constantly teaching me about balance and so I decided this would be my next tattoo. I chose the center of my upper back so the tattoo itself would have some balance and be easy to see. Even though I can’t see it, others do and compliment it often. And I always know it’s there and I’m always happy to share why I chose it. Every time I do, I give people insight into why I am the way I am. Hopefully, every conversation about my ‘balance’ tattoo is a step toward ending the stigmas associated with mental illness. “I am an optimist. An idealist. Someone who sincerely believes that if you try your hardest, you can make good things happen. Too bad others don’t always feel the same. I’m a teacher. An English teacher at that. Try putting that on your resume and not receiving copious, well-meaning inquiries about why would you want to pursue such an esoteric, outdated career path. Books? Books are great, but shouldn’t kids be getting ready for real careers? How many English majors do you know that actually have real jobs? Why aren’t you teaching more technical writing? Spending a month on Shakespeare is all well and good, but really, when is anyone going to need to know about that? On top of that, when I went back for my second round of graduate studies, I earned a certification in School Library Media. I know, I know. Crazy! Do libraries still exist? I heard that schools are getting rid of librarians left and right—are you really going to be able to get a job? Why do you need a library when you have the Internet? Can’t the kids just use the public libraries? So you just want to sit behind a counter and check out books all day? For much of my life, I’ve let those well-meaning, but ultimately defeatist questions get to me. I’ve given my energy over to struggling against myself and other people’s opinions. Am I doing the right thing? Have I thrown away my 20’s and half of my 30’s on a naive lark? Why did I ever decide not to go to medical school? I probably should have taken my dad’s advice and been an engineer. What am I doing with my life? How have I managed to throw away so much of my potential? And then last year, after starting what I consider to be the hardest (and best) teaching job I’ve ever had, I realized, enough. Enough second-guessing myself. Enough questioning my decisions. Enough of listening to what other people have to say over what I know to be my truth. This was not realized overnight. There was therapy involved. Long conversations with my family, my husband, my friends, and my colleagues. There were tears. Lots of tears. Anxiety attacks. Days when it was all I could do to pull myself out of bed, get in my car, and walk in the doors to face another eight hours of 130 kids looking to me for the answers, when I felt I didn’t have any. But by November of last year, even if I didn’t have all the answers, I had figured out enough to know that regardless of other people’s opinions, I was doing what I was meant to be doing. I was doing good, hard work. I began to believe in myself again, and I am still believing. I still believe that literature helps us know ourselves and others more perfectly—or rather, through our imperfections. I still believe that part of being ready for the ‘real world’ (whatever that means) is being able to think critically, not only in terms of hard facts and problems of logic, but also about who we are, what we want, and the roles we play in our communities. I still believe that as our world turns increasingly digital, global, and interconnected, we need to be able to find space for our own thoughts and identities through reading, writing, and thoughtful contemplation. I still believe that schools need libraries to help provide a safe space to foster self-reflection, research, and individual inquiry—not to mention the skills needed to wade through increasing amounts of specious “information” presented as fact and truth by anyone (everyone) who has access to a computer and a WiFi connection. I still believe that communication and authentic connection with each other—the ability to talk through our differences, prejudices, -isms, and the misinformation that comes along with those—will be what saves us from ourselves. I still believe in being an idealist. I still believe in being an optimist. I still believe that working hard and doing what I love will pay off in the end for myself, my family, and my community. In ‘Love Letta to de Worl’’ I found that others still believe this, too. And so, in honor of these beliefs, I did the last thing anyone (myself included) would have expected—I got a tattoo. We did convey Kelli’s love to Neda. In fact, Burning Man helped us realize that there are many of us “still believing” that love, kindness, and compassion matter, even if we don’t have these words inked on our bodies. It is somewhat cliché to say that Burning Man is about community, about starting new friendships and about maintaining them long after the last motes of golden dust have been laundered from frilly tutus and mismatched socks. But it’s true. Add to this mix the words of a poem permanently inked on bodies around the world and you get an irresistible blend of love and joy and, at times, horripilated skin. Take, for example, Jessi Fehrenbach’s tattoo. It showed up in one of the last issues of The Jackrabbit Speaks before Burning Man 2014 and then again almost immediately after the 2014 Burn. So our Kentucky Sunshine (Jessi is also known as Kentucky Sunshine, an entirely appropriate name for her both on and off the playa) became somewhat of a celebrity. 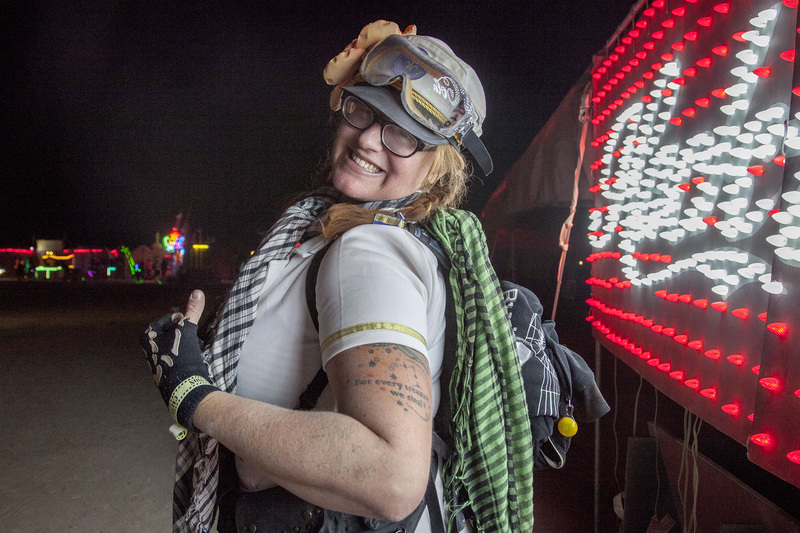 Unsurprisingly, it was she who encountered Wheeze at the Temple of Promise in Black Rock City 2015 (no accident there …Kentucky Sunshine was on the build crew for the Temple of Promise). The day after the Cotillion, we headed out in search of Wheeze. All we knew was her playa name and her camp. She was not in her camp and so we left her an oversized note, asking her to find us at KFC. “Come for fried bologna sandwiches and bourbon in the morning,” we implored. She did. Hers is by far the most delicately sized LLTW tattoo we’ve seen. It is stunning. After a few minutes of chatting, Wheeze told us she has considered getting an entire stanza of “Love Letta to de Worl’” tattooed on her body. We hugged like long-lost friends and then visited some more. There were stories and laughter (and maybe a tear or two) along the way. The golden dust traced laugh lines on our faces. P.S. Jessi’s and Wheeze’s tattoos will become part of a video artwork. Here is the 1-min preview.